Here you will find our range of gas cylinder tags. 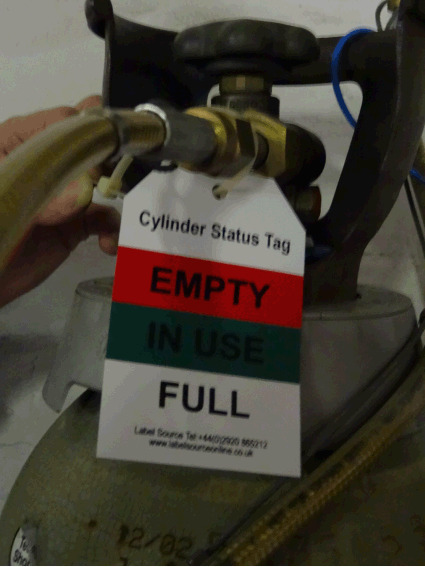 Our range of tags are often used to determine the status of the gas cylinder, if it is full, in use or empty, providing essential information to assist in the transportation, handling, storage, and maintenance of the cylinder. These universal tags are designed to be used in a variety of industries, for instance, drink dispensers in fast food restaurants and bars, Chemical processing, fork lift trucks, breathing and diving apparatus, fire extinguishers, medical industries, cooking gases, and a number of industrial applications, Soldering, welding and flame cutting to name a few. These versatile tags are suitable for labelling gas cylinders, canisters, and pressure receptacles containing LPG and Gases under pressure. We also supply Gas Cyclinder Storage Signs. Gas cylinder empty symbol and text tag. Do not use empty cylinder tag. Gas cylinder replacement symbol and text tag. Here at Label Source we strive to provide our customers with a truly comprehensive range of top quality safety signs, labels and tags. However, if you are struggling to find a label which meets your specific requirements, don’t hesitate to get in touch with us, either by calling 0800 3761 693 or emailing us on sales@labelsource.co.uk.